This post is sponsored in conjunction with PumpkinWeek . I received product samples from sponsor companies to aid in the creation of the PumpkinWeek recipes. All opinions, as always, are mine alone. Spicy, Cheesy Pumpkin Chorizo Burritos are easy to make, with Mexican chorizo mixed with pumpkin puree and Colby Jack cheese, and put a Fall twist on Mexican night. Welcome to day 2 of #PumpkinWeek 2018 hosted by Love and Confections and A Kitchen Hoor’s Adventures! You can read all about the giveaway prizes right here. 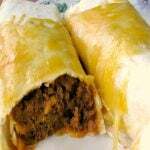 Here is how to make Pumpkin Chorizo Burritos. Crumble bulk Mexican chorizo (the kind I buy is all beef) in a large pan. I find it easiest to do this with with my hands, it just doesn’t crumble nicely when trying to do it with a spoon or spatula. Cook over medium-high heat, stirring often and breaking the meat up even more, until cooked through. Once it is fully cooked there shouldn’t be much fat left that would need to be drained. I don’t drain it at all, usually. 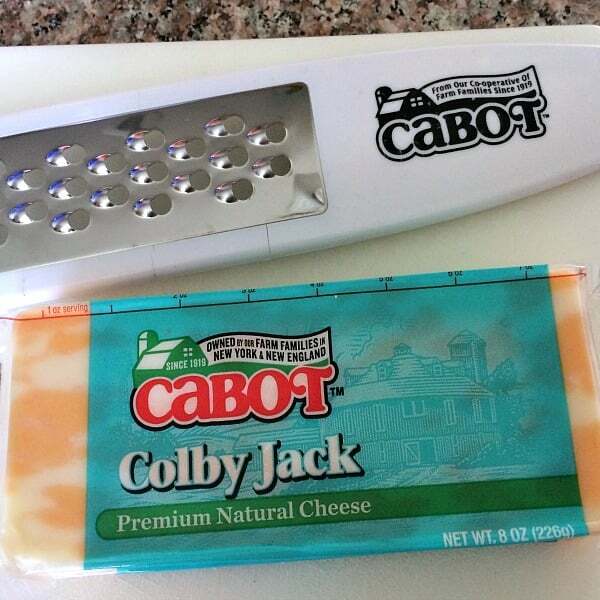 While cooking the chorizo, I shredded #PumpkinWeek sponsor Cabot’s Colby Jack cheese. We really do love all of their products here, but their cheeses are my favorite! 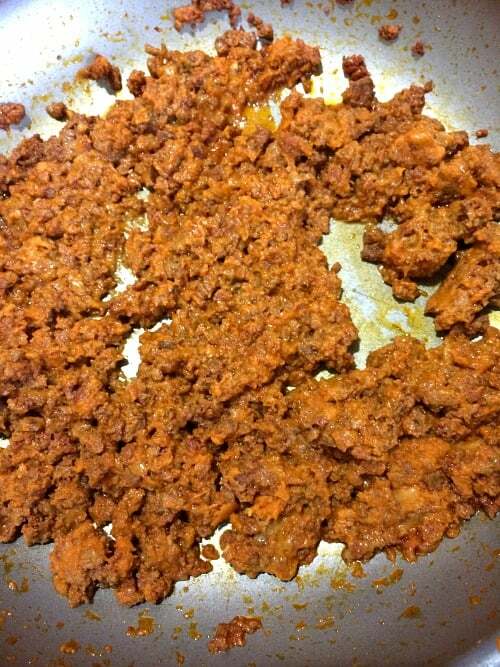 Once the chorizo is fully cooked, turn off the heat and stir in 1 cup of shredded cheese and 1/2 cup of pumpkin puree. Heat tortillas according to package directions. I always heat tortillas in the microwave. Preheat the oven to 350 degrees F. Place each tortilla on a flat surface, and place about 1/4 cup of the mixture in the middle of each tortilla. I didn’t take a picture of rolling the burritos, but you want to take both sides of the tortilla and fold them over to the middle of the filling, then take the bottom and roll up. 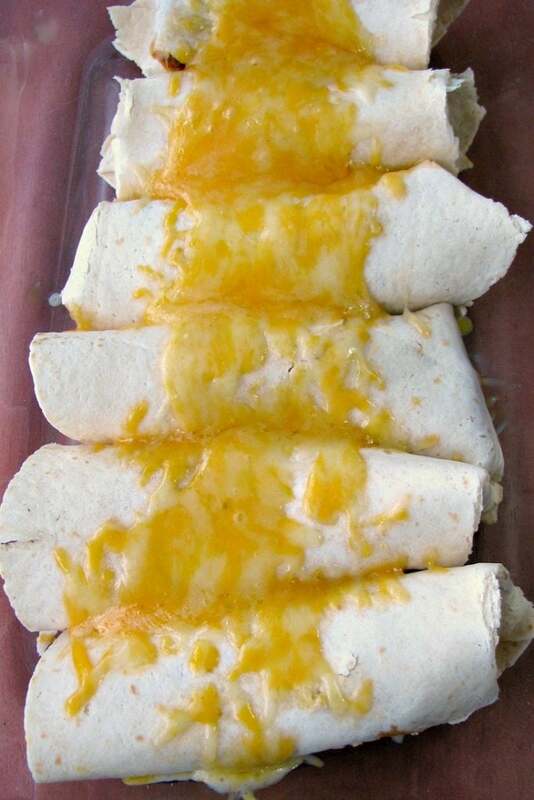 Place the rolled burritos in a baking pan and top the burritos with remaining cheese. Bake for 5-10 minutes, or until the cheese is melted. Read on after the recipe for Cheesy Pumpkin Chorizo Burritos to see all the other recipes shared today. 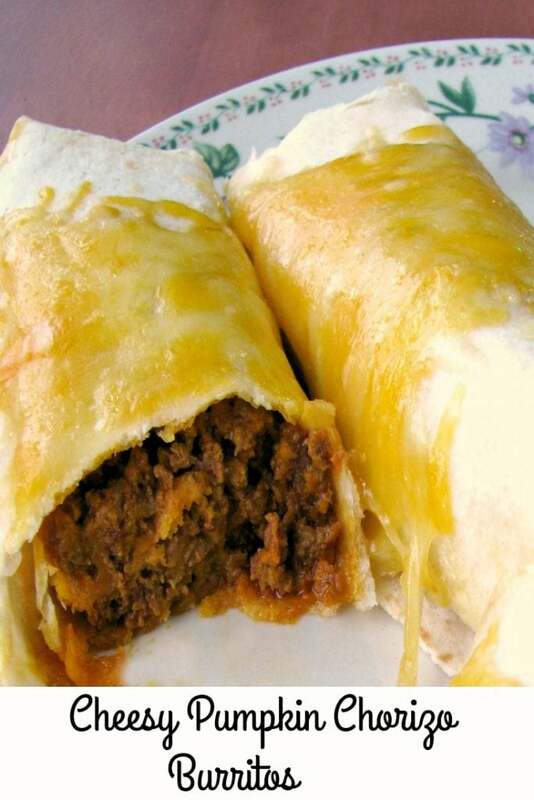 Spicy, Cheesy Pumpkin Chorizo Burritos are easy to make, with Mexican chorizo mixed with pumpkin puree and Colby Jack cheese, and put a Fall twist on Mexican night. 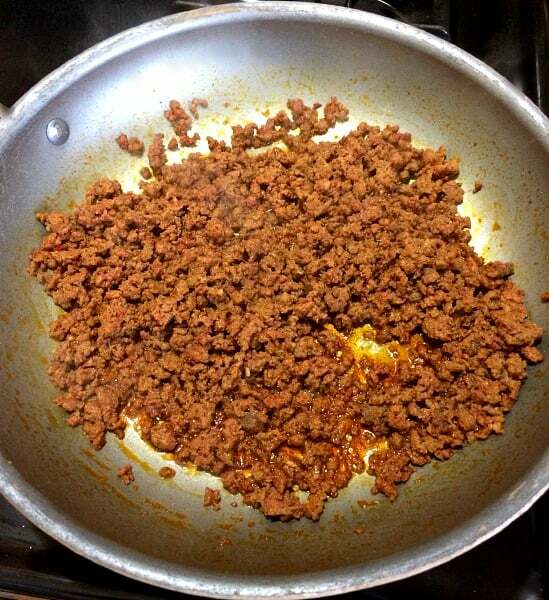 Crumble bulk Mexican chorizo in a large pan. 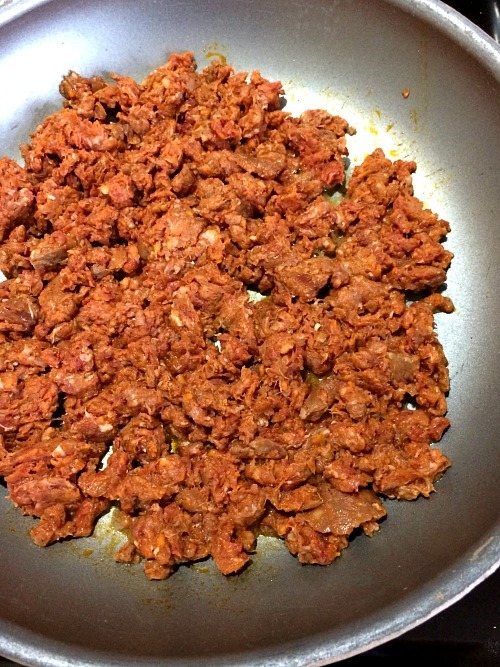 Cook over medium-high heat, stirring often and breaking the meat up even more, until cooked through. Heat tortillas according to package directions. Preheat the oven to 350 degrees F.
Place each tortilla on a flat surface, and place about 1/4 cup of the mixture in the middle of each tortilla. Take both sides of the tortilla and fold them over to the middle of the filling, then take the bottom and roll up. Place the rolled burritos in a baking pan and top the burritos with remaining cheese. Bake for 5-10 minutes, or until the cheese is melted. This is such a simple but packed with flavor, recipe! 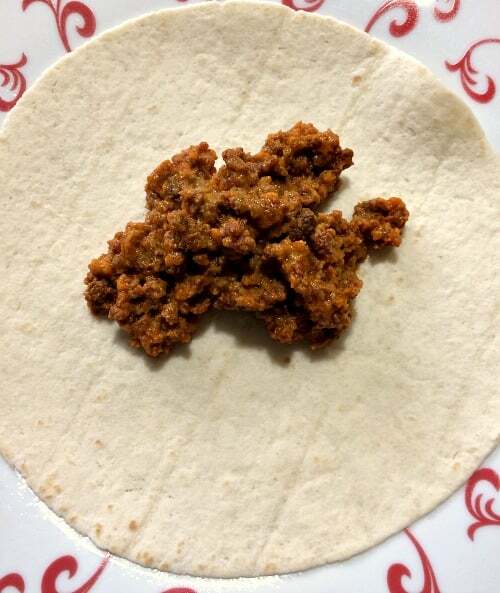 I always forget about chorizo but being in MA, I see it all the time!